Basse-Terre is the prefecture (capital city) of Guadeloupe, an overseas region and department of France located in the Lesser Antilles. 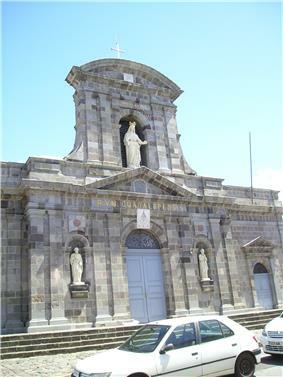 The city of Basse-Terre is located on Basse-Terre Island, the western half of Guadeloupe. 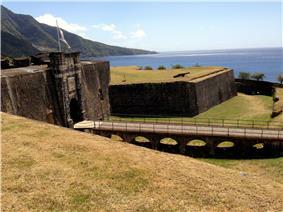 See Basse-Terre Island for the origin of the name Basse-Terre. The city was founded in 1643, in the mountainous section of Basse-Terre, one of the two islands which compose Guadeloupe. It was destroyed many times as a consequence of the Anglo-French wars. The fear around the eruption of La Grande Soufriere in 1976, led to the town's temporary evacuation. Today the town is quiet, with its French provincial atmosphere and colourful port life. Home of the noted writer of the Négritude movement, Paul Niger. In town is the Cathedral of Saint-Pierre-et-Saint-Paul, a 19th-century building which has a notable grey stone highlighted by white statues; many other colonial buildings; La place du Champ d'Arbaud, the main square and Le Jardin Pichon, the park adjoining to the south & the Zoological and Botanical Park lies on a 1,500-foot (460 m) hilltop garden on the banks of La Rivière-aux-Herbes. This is a reserve of the plants and animals of Guadeloupe. ^ "Weatherbase: Historical Weather for Basse-Terre".